Create a package called Prehistoric Enumeration, and within this a source linked to the dinosaurs workbook in the above folder. 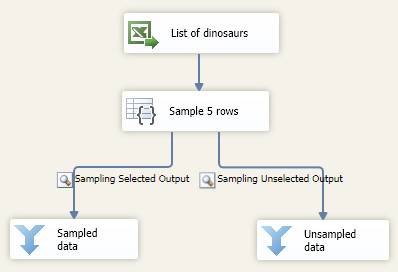 The start of the list of dinosaurs in the Excel workbook. We send the 5 sampled rows down the left pipe, and all of the others down the right pipe. Only include the dinosaur name, its period and its diet. 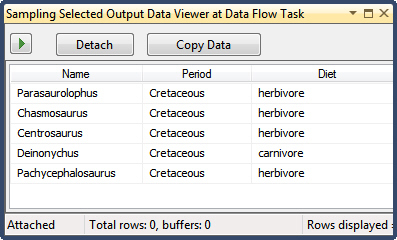 This data viewer, for example, is showing the 5 randomly selected rows (don't forget that yours will select different rows).